Like many programmers working with personal computers in the mid-1980s, Jack Eastman thought it would be fun to write code for a “screen saver”—a graphics program that would help prevent static images from burning into the phosphors of cathode tube monitors and causing permanent damage. Eastman first had to communicate with the Mac’s operating system to recognize such a program, getting help from Berkeley Systems software company employee Patrick Beard. After some simple modules had been written—rippling water, stars, worms—Beard’s bosses took note and asked the two to finish a complete software program. After a successful freeware launch, Eastman stumbled into his kitchen late one night and glanced at his toaster. He imagined it had wings. Not long after, millions of computers around the country went to “sleep” dreaming of flying small appliances. In 1989, Berkeley and Eastman’s After Dark collection of modules paired up with Software Dynamics, which had been programming similar software under the Magic banner for Windows users. (“Magic” was dropped because, according to the company, some people thought it had Satanic connotations.) 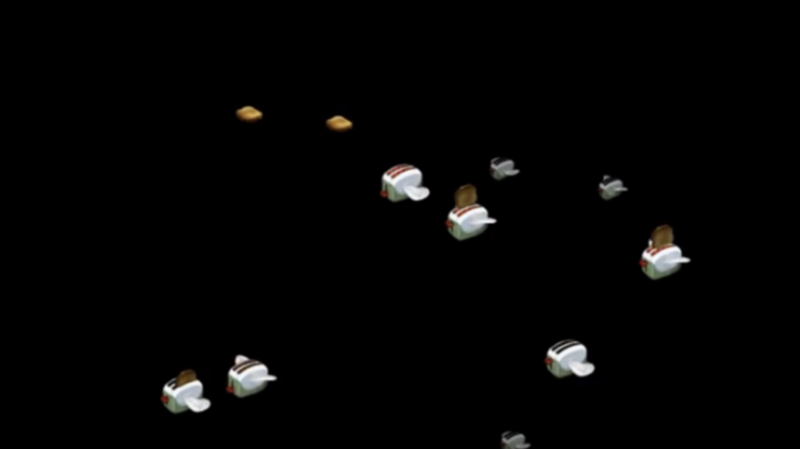 While screensavers had typically been passed around as freeware, After Dark’s attention to detail—users could program the number of fish swimming in a tank, for example—had PC users spending $30 to $40 on floppies or CD-ROMs. By 1992, Berkeley was selling 10,000 copies of After Dark 2.0 every month. The psychology of the screensaver became a popular theme in the media’s coverage of the computer industry. As monitors grew more sophisticated, reducing the concern over burn-in, users tended to use the possibility as justification to buy a pretty frivolous piece of software. Some found the twinkle of a module like Starry Nights hypnotic; others avoided productivity by playing with settings. Inversely, analysts claimed that employees actually got more done when they were able to personalize their workspace. Berkeley eventually licensed characters from Disney, The Simpsons, Star Trek, and other pop culture brands. By 1992, After Dark became the top-selling software program in the world. After experimenting with versions that were Energy Star compliant, offered playable games, and displayed headlines from USA Today, After Dark wound down in the late 1990s, as new PCs often came preloaded with savers. Owing to nostalgia, many users still prefer to keep Eastman's unique approach running in the background. Even with advances in graphics and hardware, only his program has a lever that can adjust the brown-ness of the toast.